For those unfamiliar with the term, fulling is the act of turning a wool fabric into a thicker, “fuller", often warmer fabric with more body. There are several fulling methods, some used in combination. Fulling the wool to the extreme will turn the fabric into felt. I was prompted to write this blog post by a comment I received on my first Westerly Pullover post with questions on my fulling technique. I'm in no way an expert at fulling, but I'm very willing to share my partially improvised method. I always enjoy discussions of fabrics and fibers, so if anyone reading this wants to add two (or more) cents, please do so in the comments. Recommended resources are also appreciated. I decided to take this route because I so excited to use the Westerly fabric, knitted with natural wool from the Imperial Stock Ranch. I also, however, wanted a fabric with a little more body for the type of sweater I had in mind. I wanted a very casual, everyday sweater. I thought maybe my lacy Westerly would produce a dressier sweater than what I was aiming for this time. Fulling to the rescue! So how does fulling work? Wool like all protein fiber has a surface layer of microscopic scales. When subjected to heat, certain soaps, agitation, or a combination of these things, the scales begin to bind together. The little spaces between the stitches get a little or a lot smaller. The fabric shrinks to some degree, though it's hard to predict how much or in what direction. A fabric with lots of drape has more body and appears thicker after fulling. A fabric that tends to ravel will now ravel less or not at all! The Westerly fabric also became a little less stretchy. I put very warm water (sufficient enough to cover my approximately 1.25 yards of fabric) into a tub with a small amount of unscented laundry detergent. The water temperature was cool enough for me to stick my hands in but not really comfortable on my skin. I wore rubber gloves for the process. I swished the fabric in the water until the yarns looked plumper and hairier but with the stitch pattern remaining visible. Though the yarn was wet, I could clearly see the change in the yarn. I'm guessing I swished it for about 2 to 3 minutes. After draining the water from the tub, I rinsed the fabric with tepid water holding the shower head in my right hand and slowing redistributing the fabric as necessary with my left hand. Because I used such a small amount of detergent, this didn't take very long. I placed the very wet fabric in a plastic bag. The fabric was heavy because it was still full of water, as I didn't wring or roll the fabric in a towel. Instead I carried it to the (top-loading) washing machine and ran the "spin" cycle that comes after the "gentle wash" cycle. I allowed the fabric to dry on a flat laundry rack. And that was it! 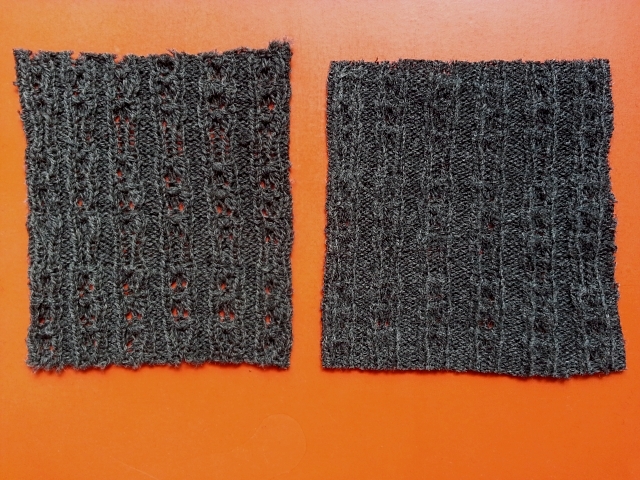 From comparing my test swatch to untreated fabric with the same stitch pattern repeat, I know that my fabric shrunk a little in length. Since I didn't measure my garment fabric after the process, I can't be sure how similar the result was compared to the swatch, but it appears to be close. One more important thing -- even if you have no intention to full your wool fabric, it's always a very good idea to wash it before laying out your sewing pattern and cutting. I know you've heard this before from me (and others), but now I have closeup pictures to show the wonderful transformation of the wool! 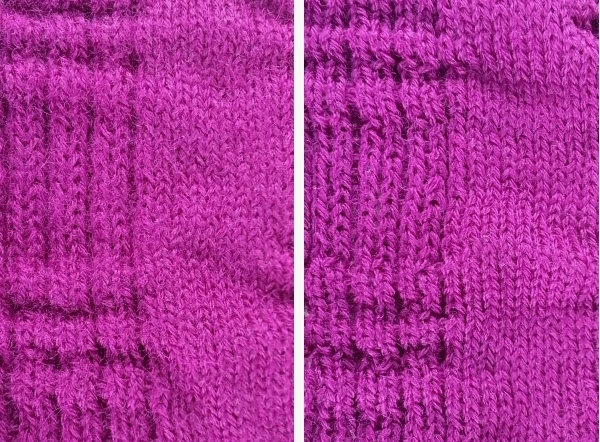 Here's Washington Square in Deep Raspberry after washing (in cool water with a little detergent, no agitation, air dried flat) on the left and before washing on the right. Washing "relaxes" the stitches, removes any wax used at the knitting mill, and simply makes the fabric easier to work with. there's a book ,although written for weavers, magic in the water by laura fry. not only does it have lots of information, but also samples of before and after cloth. Thank you for the book recommendation. Nice title, so true. found this today and sounds promising.